Shelf FC are closing in on an unlikely title success in the Haslem-Sheppard Halifax and District AFL. 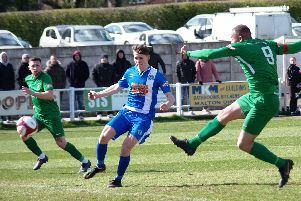 They need seven points from their final three games against opponents winding down for the summer to overhaul long-time leaders Ryburn United after beating Sowerby Bridge 5-0 at Savile Park yesterday. Goals from Josh Hans (two), man of the match Matthew Hartley, Alex O’Keefe and Sam Henderson gave them victory over Thursday’s West Riding Trophy winners. Shelf moved into second place with their ninth league win on the bounce and look to be coping well with an exhausting schedule after building a huge fixture backlog. They now have just three games left at their Westwood Park base - a rematch against Sowerby Bridge on Monday plus visits from Greetland and Shelf United on Wednesday and Friday respectively. Yesterday’s other scheduled fixture, between Flying Dutchman and FC Ovenden in Division Three, failed to go ahead because Flying Dutchman could not raise a team.